HUNDREDS OF CUSTOMIZED PROMOTIONAL PENS! 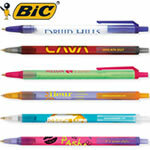 The best in brand name imprinted pens are right here! Our marketing experts will help you design your next imprinted pen to fit any promotional marketing campaign. We only carry the BEST promotional pen brands like Paper Mate, Bic, of promotional pens like Paper Mate Pens, Uni-Ball Pens, Bic Pens, Sharpie Markers and more! WHY BUY PENS FROM PENIMPRINT.COM? NO SETUP FEE for your first color imprinted on your advertising pen. 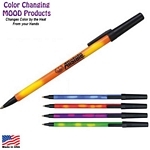 Your promotional pens are imprinted with a 1-color logo for FREE. LOWEST PRICES We have compared all brand named promotional pen prices and make sure that we are #1. Price us around, you'll see! FREE SHIPPING on all of our imprinted pens if you spend a minimum of $200. Our pens ship UPS or FEDEX ground, expedited shipping available. FREE ART RECREATION We will be happy to redesign your artwork or company logo on your promotional pen, and we do it for FREE! The Uniball 207 Gel Ink Pen is RED HOT!! Uniball Promotional Pens have been ideal for signing documents and everyday office use. 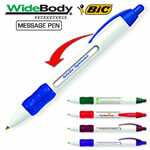 This imprinted promotional pen comes with Gel Ink standard and available in six possible ink and trim colors. The Uniball Gel Ink 207 Pen allows up to a 4-color logo or slogan imprint and is already the preferred pen for most office managers. The Uniball 207 comes with a Free 1-Color imprint and an extremely high retention rate for your clients. View our Top 10 Promotional Pens Sold. WHY ADVERTISE WITH IMPRINTED PENS? Why do promotional pens make the best promotional products? Because imprinted pens are a fairly cheap promotional giveaway that has a long shelf life and an high retention rate. Everyone uses pens, so why not give your clients something that they can use. Customized Pens are also easy to distribute at trade shows, company meetings, or mailing them in a bulk mail advertising campaign. You can read more ideas in our Marketing Resource Library, where you can find a promotional products glossary and tips on advertising with promotional pens. PenImprint.com offers eco-friendly solutions with imprinted recycled pens, wooden pens, and biodegradable pens. Going Green has never been so easy, we will be happy to add an eco-friendly or recycled logo to your artwork as well and for Free. We Offer a FREE 24 Hour Rush on selected imprinted pens and engraved pens. These pens will ship 24 hours after your artwork approval. Various Ink Colors We now offer more ink color options on our promotional pens. Now you can search for your pen by Ink Color. BIC Pens are available in Medium Point and Fine Point Inks. Different ink types and colors allow you to be a little more creative with your imprinted pen marketing. popular retractable in promotional products and BIC Clic, BIC Clic Gold and Clear Clics, the most popular retractable in the banking and financial industries. Easy-Glide System Ink: This exclusive technology offers 50% smoother and bolder ink than our current ballpoint. It writes with fluid lines and no smearing! Available in Pro Select Office Series Retractable (over 3 miles of write-out) and Ultra Round Stic Grip (offers 1 mile of write-out). It's worth the $0.05 up charge! Request a sample. Promotional BIC Clic Stic Ice Pen, Item #CSI comes with a push top retractable plastic design for an affordable company promotion. Our Customized Plastic Retractable Pens include an artwork imprint to advertise your company and services.